Wandering through Portobello Road market, with its many branches of “I Saw You Coming” was illuminating, especially in the titfer department. This tourist trap morphs into the more genuine environs of Notting Hill market, and then under the Westway, Clash territory. Eventually we emerge into Ladbroke Grove where we witnessed a lorry fail to make it under a bridge, which was ironic, as well as being something I previously thought only happens in fiction. Judging by the look on the driver’s face, he probably thought the same. We didn’t stick around to witness the inevitable resulting traffic chaos as the lorry attempted to reverse back to the previous junction, about 150 yards behind him, as we had a date in Fulham with a pizza and a pint prior to wandering up Fulham Broadway to Stamford Bridge, home of footballist Johnny-Come-Latelys Chelsea, and the location of the rather fine subterranean music emporium Under The Bridge for tonight’s gig, a date with one of my Deutschrock heores Michael Rother, whom I have never seen before. This keeps up my current gig-going dictat of trying to see bands I’ve never seen rather than bands I’ve already experienced. First up was Thurston Moore, who has a thing for playing with German legends it seems. Probably possessed of the highest profile of any of the current crop of American avant plank spankers, Thurston came on, sat down, plugged in, and took us on a 50-minute journey across a broiling sea of feedback and looping, interspersed with more introspective moments. It was quite hypnotic, and got a fulsome response from the two-thirds full audience, which would swell to the 300 or so capacity by the time Herr Rother and his band took to the stage. 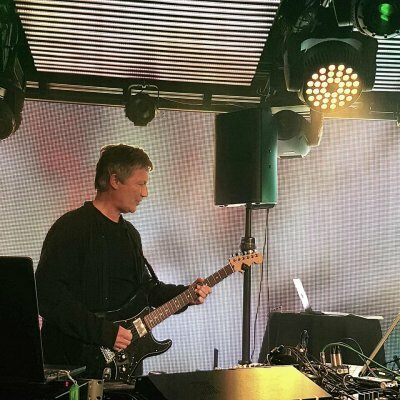 The focus of this gig is the album Sterntaler, Michael Rother’s second solo album originally released in 1978, tonight played in its entirety in the middle of the set. Rother has also recently released a bargain CD box set featuring all four of his solo albums, plus a soundtrack, which if you are as unfamiliar with his solo work as I am, is highly tempting. The music on this album is precise, simple, and effective, and simultaneously intense and relaxing. As the drummer on the album was none other than the inventor of the motorik beat, Jaki Liebezeit, and given that Rother’s breakthrough band, Neu!, had one Klaus Dinger behind the kit, a man who perfected its driving intent, it is unsurprising that the tunes on Sterntaler are propelled by a quiet metronomic intensity that uses repetition to just the right degree. Neu! 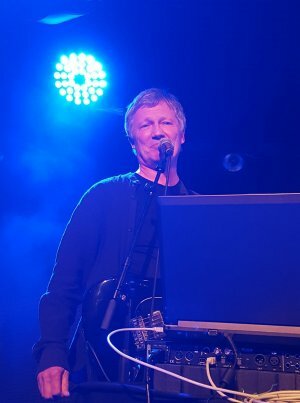 were one of my favourite German bands of the era, and it was great to finally get to hear those highly familiar tunes played by their co-creator. During the set Michael was cherry picking tunes from across his long career which meant we got to hear some Harmonia too, but the highlight of the evening for me was the final two songs, both Neu! 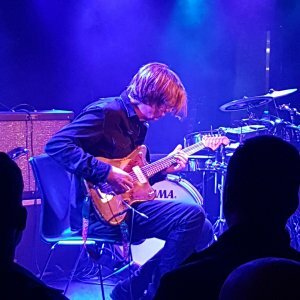 classics, when Thurston Moore joined the band to add an extra frisson to proceedings that broke the music out of its somewhat elegiac and glacial surroundings, adding a marvellous visceral edge. Those two songs, Negativland and E-Musik, were joyous affairs that had the whole place bouncing. Michael’s music is self-contained and what might be termed anti-jazz given its regimented structure, but when you add the mystery ingredient of Thurston’s strange noise it breaks free to become something other, and utterly compelling. 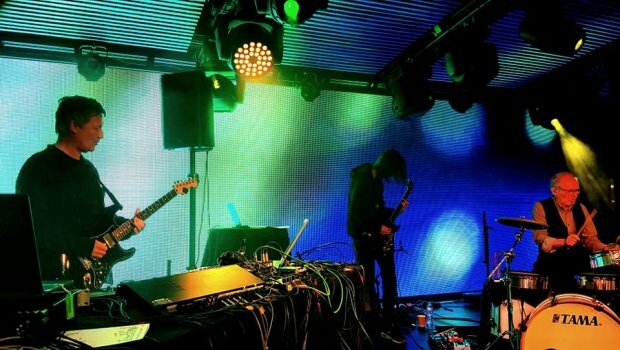 Of course, what drives all this fine music is the good old motorik rhythm, something that sounds deceptively simple but must be physically and mentally demanding on the drummer given its relentless nature. Tonight’s star behind the kit was Hans Lampe, who has a long connection with Neu!, and was the drummer for Klaus Dinger’s post-Neu! band La Dusseldorf, as by then Herr Dinger had switched instruments to the guitar to fulfil his rockstar longings. 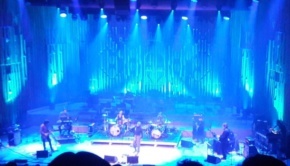 There was no encore, there didn’t need to be, the whole evening had a perfect symmetry as it was, and we left for the long journey homewards thoroughly sated.